We woke up in the morning feeling more positive about our lodging; the room really was rather nice, and when we pulled aside the ubiquitous heavy curtains we were treated to a great view of the Athabasca Glacier. Hence the name Glacier View, I suppose. Not wanting to linger at the Icefield Center, we headed out early and drove down to The Crossing for breakfast. The view from our room at the Icefield Center. Driving south through Banff Park, we were enjoying yet another glorious sunny morning. 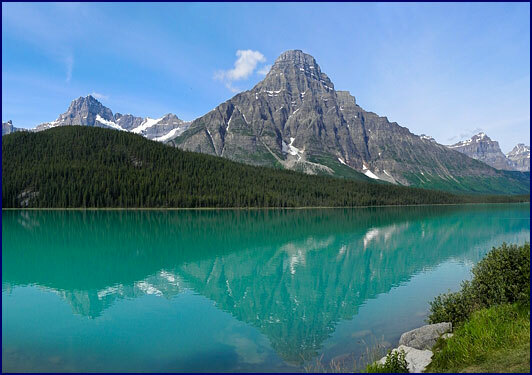 The mountains glowed in the early light, and the sun's rays highlighted the brilliant color of the lakes and rivers. We had a rather unusual experience along the way; there was a long section of road that appeared to be going steadily downhill, yet when I took my foot off the gas the car would coast to a standstill, proving that we were actually going up - it was a very weird optical illusion. We came to Waterfowl Lake and stopped at the same pullover where we had Happy Hour on the first evening. The sun was highlighting the turquoise water, and we could see Bow Glacier on the other side. There were ducks on the water. 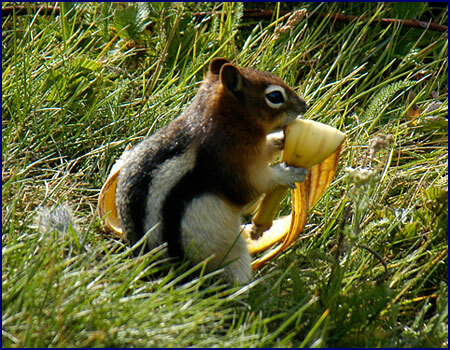 A gold mantled ground squirrel scurried from rock to rock looking for food; he hit the jackpot with a discarded banana peel. A bit further on we stopped beside Bow Lake, beneath the Crowfoot Glacier. We had seen it on our way north the first evening, but it was much more photogenic in the morning light. The mountains were reflected perfectly in the mirror-still surface of the water. A pair of loons floated near the shore, occasionally diving, disturbing the mirror image with their ripples. I had come across some interesting grass-like plants by the road the day before; they had gracefully curved brushy heads like wheat. I had picked a few and put them on the car dashboard, intending to take them home for my mother, who collects such thing. But we discovered that in the warm car they had opened up and transformed; they now resembled long haired mutant caterpillars that had stuck a finger in an electric socket, or perhaps leggy spiders from mars. They had taken over both the dashboard and the back window of the car, and despite our efforts to put them out, they seemed to be running amuck in the car. 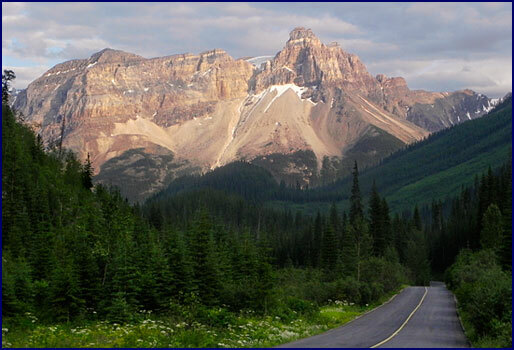 We headed west into Yoho National Park, which adjoins Banff. After a couple of missed turns we found our destination, a small nearly empty parking lot across from Wapta Lake. 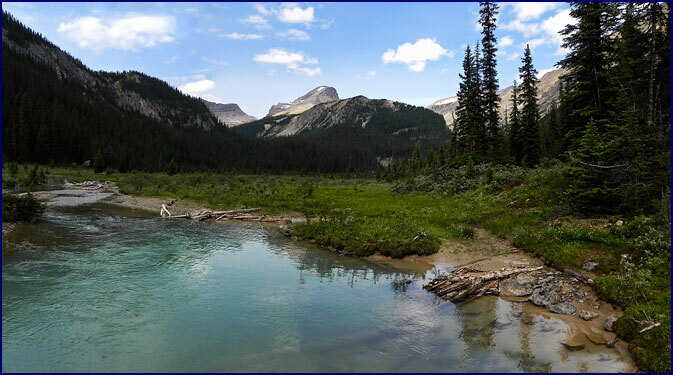 It was the trailhead for Sherbrooke Lake, yet another hike with a Premiere rating in the Don't Waste Your Time guidebook. We chose it largely because the elevation gain was not too severe; we were quite tired after the exertions of the week - our minds were willing but our muscles were lagging. The trail took us up through a pine forest. We walked uphill for about an hour, and the noise of the cars on the highway faded away behind us. It was cool and pleasant in the woods, and the path climbed gently, surrounded by large pines and an array of wildflowers. It was just as well we had chosen a less demanding hike; the cumulative efforts of the week had left our legs rubbery, and soon we were tripping over the network of roots beneath our feet. After a while the trail leveled off and we came to openings in the trees where we could glimpse the mountains. The path sloped downward to the shore of Sherbrooke Lake. 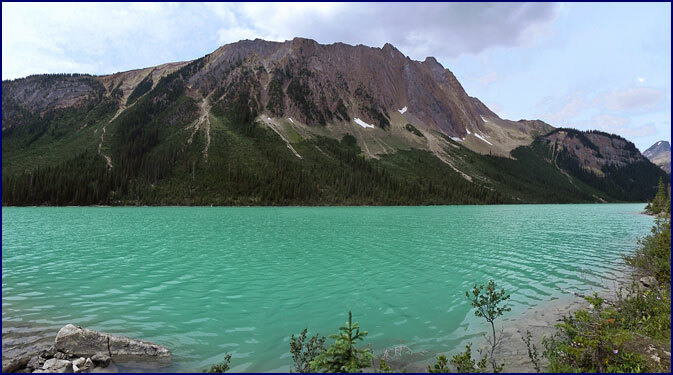 It was a brilliant turquoise color, surrounded by high peaks. We sat by the lake in total solitude, enjoying the sunshine, and just being still. (At that point, anything that did not involve exertion looked good to us.) It was very quiet and peaceful. We had not seen another person since we left the carpark. Presently we moved on, following the east shore of the lake. 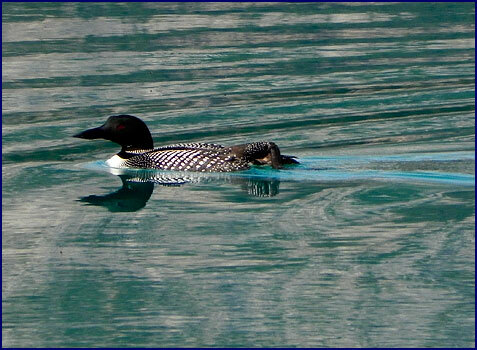 A loon dived in the water, staying submerged for several long minutes before surfacing far from his original spot. On the other side of the lake, a duck of some sort ran across the top of the water, slapping its feet noisily on the surface, leaving a wake behind him. A fish jumped with a splash, creating ever widening ripples in the lake surface. At the north end of the lake the trail climbed again, following a gorge carved out by a swift stream. Soon we came to a large cascade, perhaps thirty meters high; the water rushed down over a series of waterfalls like stairs. The sound of the water was very loud. We sat for a while watching the rushing water, and then continued up the path through the woods. We came out into a bright meadow, ringed with pine forest and surrounded by towering mountains. The stream wound through it, tranquil, a blue-green serpentine among the tall grasses and wildflowers. Of all the places we had been, this was the most serene. No one else was there, and it felt like no one had ever been there before. We sat quietly beside a pool at a bend in the stream, letting the peacefulness of the meadow wash over us. Don't think, just be. I took off my hiking boots and soaked my tired feet in the water; it was icy cold! We munched on trail mix and granola bars, and I filled my water bottle from the glacier-fed stream. After a while it was time to head back. As we hiked past Sherbrooke Lake, we met two young women, the only people we had seen all day. They wanted to know if there was any place to swim if they hiked up to the meadow; I told them sure, you can swim in the pool formed by the stream. I didn't mention the water temperature - there are some things people need to find out for themselves. Returning to the car tired but happy, we had a glass of wine from the last bottle of Stoneleigh. Then we set out to further explore Yoho Park. We drove up the Yoho Valley Road and stopped at an overlook above the rather violent convergence of the Yoho and the Kicking Horse rivers, watching the turbulent water roar down the riverbed with amazing force. Further on we came to a viewpoint for the Spiral Tunnel, a railroad switchback built inside Cathedral Mountain. The railroad track enters a passageway into the mountain, where it changes direction in a figure-eight tunnel before exiting at a different opening. Just then a train came, and we watched as the front of it came out of the tunnel while the back part was still going in. We congratulated ourselves on our impeccable timing. We continued down the road toward Takakkaw Falls. With its rugged mountains and sheer vertical cliffs, Yoho Park was every bit as impressive as Banff, and probably a little more unspoiled. We carefully negotiated a set of incredibly steep switchbacks, with hairpin turns so tight that they were built with backing-up spaces. We were grateful for the guard rail, one of the few we had seen on smaller roads during the trip. We kept an eye out for animals, but the mountain slopes seemed too steep even for bears. We came around a bend, and quite suddenly we saw across the valley before us an amazing waterfall, bursting from the top of the cliff and seeming to explode down the mountainside. Screeching the car to a halt in the middle of the road, we climbed out and stood gazing at the falls in awe. After a while we found a place to park, then followed a well-used path toward the base of the falls. We hadn't thought we had any more walking in us, especially uphill, but the excitement of seeing Takakkaw Falls superseded our fatigue. 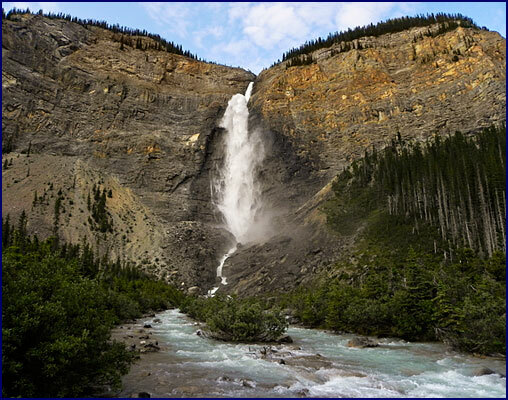 From the path it appeared that the falls emanated from the top of the cliff, but there is actually an icefield and glacier above the falls, visible from a higher perspective. We came to the base of the falls and gazed up, awestruck. The air was filled with spray, and the temperature was about ten degrees colder. The volume and force of the water was daunting. The stream poured over the top of the cliff and fell straight down into some sort of natural basin near the top, where it ricocheted off the rock, seeming to explode upward and outward, pulsating, creating an enormous ever-changing plume of water which fanned out and turned to spray as it plummeted down over a thousand feet into the pool in front of us. 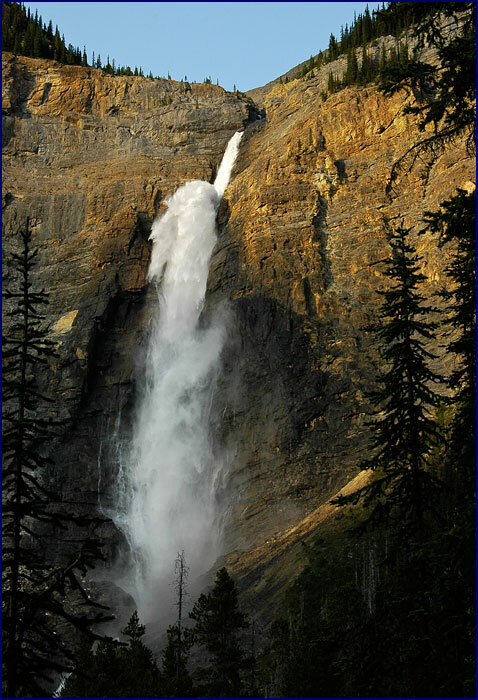 Takakkaw Falls was awe-inspiring, and we felt dwarfed by its power. The deafening roar of the water drowned out all other sound. We stood there a long time and watched as the torrent burst out from the cliff in waves, changing shape and hurtling downward like comets of water with trailing tails. Presently we started back up the path toward our car, but something made us turn and look back. The setting sun broke free of the clouds opposite, and sent the day's last bright rays of sunlight to illuminate the top of the cliff and the falls. We looked on with a sense of reverence. Back in the car, we sat quietly, filled with appreciation for all that we had seen. Sipping the last of the Stoneleigh, I made a silent toast of thanks: To the wilderness, the mountains, and the creatures who live there. To good friends, good fortune, and whatever or whoever it is that sends the sunlight down over the waterfalls.